Just nine seconds. That?s all that separates Tour runner-up Cadel Evans (Predictor-Lotto) and stage winner Samuel Sanchez (Euskaltel-Euskadi) – third and fourth overall – after the Vuelta?s last day in the mountains. For the last two and a half weeks barring the stage to Torre Pacheco, the weather has been goood. But on stage 19 the heavens opened with a vengeance for the short, sharp 133 kilometre stage from Avila to the Alto de Abantos summit finish, tackled twice on Friday – and on both occasions in a downpour. The second and final time round, the main favourites reached the foot of the 12 kilometre climb almost all together. Although Sanchez?s team-mate Igor Anton was in a small group a handful of seconds ahead, race leader Denis Menchov (Rabobank) was looking as solid as ever despite the teeming rain. Not so Evans, who looked uncomfortable when Sanchez charged away. The Australian then cracked completely when Sastre, closely followed by Menchov, opened fire a third of the way up the climb – a narrow mountain track picking its way through dense pine-woods. The CSC leader quickly bridged across to Sanchez and with Menchov happy to follow the duo?s wheels, slowly but surely the gap opened on Evans. Come the summit Evans was 1-25 back, in 15th spot, crossing the line so tired he had to hold himself up against the barriers. He had managed to hang on to his third place by nine seconds from Sanchez, a margin even closer than the 23 seconds that separated the Australian from Alberto Contador in the final classification of the ?07 Tour. 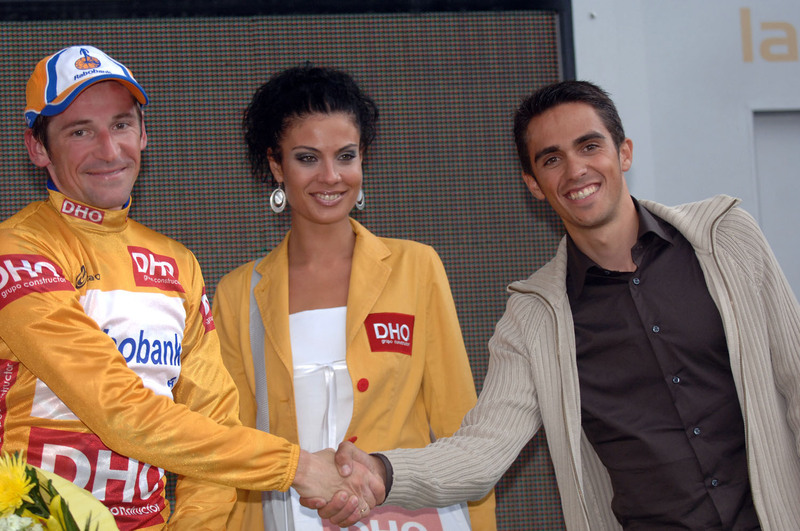 Sanchez, meanwhile, had easily outsprinted Relax-Gam rider Dani Moreno for his second mountain stage win in the 2007 Vuelta. But he made no bones that he would have been more interested in getting onto the provisional podium. ?My idea was to attack on the descent of the second last climb, the Robledondo, get across to two team-mates ahead and get to the foot of Abantos 90 seconds up on the rest.? ?But it didn?t work out because they got the information wrong on the race radio and said the descent from Robledondo was dry, not wet. So I didnt’ attack and had to wait until the final climb. Sanchez had the considerable consolation prize of a second stage win, but he said that it was unlikely that he could finally topple Evans from the podium before Sunday’s finale in Madrid. ?If he has a bad day and I have an exceptionally good one, then I might.? he said. Meanwhile race leader Denis Menchov almost has the event wrapped up – or as he put it ?95 percent won. But in any case, I want to take Saturday?s time trial to prove I?m the strongest here. ?